I've been hosting Songs To Be Murdered By for the past 25 years. 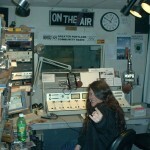 I also share the Metal Director duties with another DJ at the station. I try to make it out to as many shows as I can - nothing like enjoying a Pit! \m/\m/ I love METAL and I'm always happy to support local bands!